ALEX Salmond’s links to Rupert Murdoch were under scrutiny yesterday when the First Minister was accused of being behind the leak of the independence referendum date to the media tycoon’s new Sunday newspaper. The day after Mr Salmond met with Mr Murdoch at the First Minister’s Bute House residence, his relationship with the News International boss was criticised at First Minister’s Questions. Mr Salmond entertained Mr Murdoch at a time when he has also been holding meetings with leading executives of Trinity Mirror, the newspaper company that owns the Sunday Mail and the Daily Record – the Scottish tabloid that has traditionally been a loyal Labour supporter. The editor-in-chief of the two newspapers, Allan Rennie, and Trinity Mirror chief executive Sly Bailey have met Mr Salmond, leading to suggestions that the publishing house will set aside some of its hostility to the SNP. 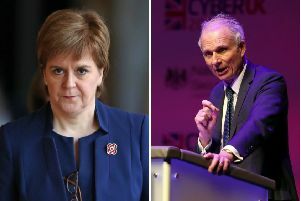 A spokesman for the First Minister last month confirmed the meeting, which was held in London around the time Mr Salmond delivered a lecture at the London School of Economics on 15 February. But the spokesman said the main topic of discussion was jobs and investment. The leak of the referendum date to a Murdoch publication not only irritated News International’s rivals, but it also angered Ms Lamont. In front of MSPs, the Labour leader claimed that the First Minister was “prepared to compromise the referendum” for Mr Murdoch. In response, Mr Salmond said 18 October 2014 was a “possible date” for the independence referendum, but insisted the matter would not be decided until the close of a Scottish Government consultation. Ms Lamont pointed out that the First Minister had written a column for the Sun on Sunday’s first edition and asked if he had tried to find out who was responsible for the letting the date slip. “What steps has the First Minister taken to determine the source of that leak?” she asked. Earlier, Ms Lamont had opened her line of questioning by asking Mr Salmond about the Leveson Inquiry, which is examining press standards. Mr Salmond said he supported the inquiry, but pointed out that when the Information Commission had highlighted “widespread malpractice across the press”, there were “very few Scottish examples” of this.